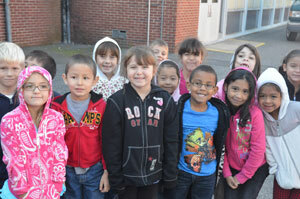 William Rall Elementary School is an exciting learning community. We value our children and are dedicated to providing nurturing, learning experiences for them each and every day. Our faculty is comprised of a group of talented, caring individuals who consistently challenge our students to realize their highest potential. Our PTA is extremely active and plays a vital role in helping us reach our goal of offering the children the highest quality educational experience possible, making ours a great parent and school partnership. The approximately 590 students that attend Rall inspire us every day. It is truly an honor to have the opportunity to interact with them, watch them grow academically, socially and emotionally and help them celebrate their successes. Our learning community has a great deal to be proud of. Not only do the students realize academic success they also understand what it means to be good citizens. Diversity is always celebrated at Rall as one of our many strengths. Character education plays a large role in our program and our students demonstrate a respect for oneself and each other. Each of our students in his/her own special way contributes to and plays a role in the Rall community. Together, there is nothing we can’t achieve. One of the primary goals at William Rall is to foster a love of reading and to encourage a habit of lifelong reading (Readers are Leaders!). We embrace a balanced literacy philosophy. Throughout each day, the students are engaged in a variety of literature-based activities designed to give students access to the powerful world of reading and writing. Through the use of independent reading and writing workshop, guided reading and writing groups, shared reading and writing, literature circles/clubs, and strategy groups we are able to engage students in learning that is accessible and appropriate to their individual needs. In addition, we are able to foster critical thinking that successfully addresses the New York State Standards and core curriculum. The William Rall faculty works hard to provide our students with a well-rounded education. In addition to the academics offered, our students have the opportunity to participate in Physical Education, Art, Library, Vocal and Instrumental Music. All areas of study are designed to address the New York State Standards and empower our students to think critically and work cooperatively. Extra Curricular activities such as, Student Council, Homework Clubs, Recorder Club, Stage Band and Orchestra are offered to provide cultural experiences and assistance to best meet our children’s needs. Technology plays a vital role in our classrooms with students having access to our laptop lab, internet and Smart Boards. Services in the areas of Speech, Reading, Math, English as a Second Language (ESL), Social and Emotional Development, Physical and Occupational Therapy and resource room are also provided. Our PTA sponsors programs such as, Cultural Arts assemblies, book fairs, Red Ribbon Week, Parents as Reading Partners (PARP), bus safety and other special events that serve to enhance the school experience and add to the enjoyment of being part of the Rall Family. We look forward to a challenging, exciting school year at Rall where we will continue to lay the foundation for life long learning and independence. East side of Copiague Road from West side Straight Path to Berry Street. All of Berry Street from Copiague Road to Wellwood. East side of Wellwood Avenue from Sunrise Hwy. to 9th street. All 9th St. from Wellwood Avenue to Rt. 109. West side of Rt. 109 from 9th Street to Sunrise Hwy.